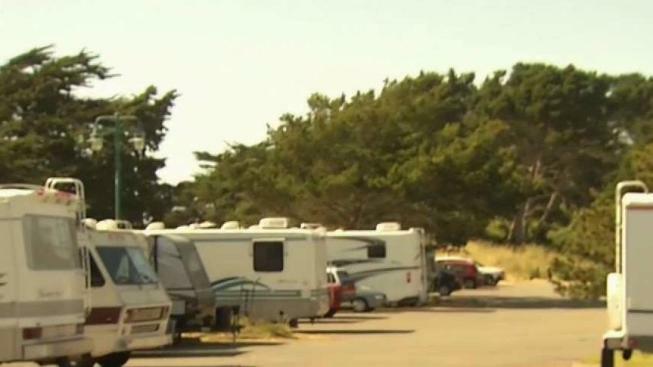 Monday was a very unwelcome moving day at the Berkeley Marina, where dozens of RV campers have been forced to move out from spaces they’ve been parked in illegally for months. Memorial Day was the deadline for the campers to leave, and police arrived early in the morning to enforce it. But while the RVs indeed moved, some didn't go far. They found a parking lot at a restaurant down the road, and appear to be staying put, saying they have nowhere else to go. Camper Naomi Gonzales says she’s worried about her family’s future. They had been camping in their RV along Marina Way near the Berkeley Marina since last July. "I don’t know why this is happening," she said. "This is all we have." The city of Berkeley says the campers have created a health and safety risk. Construction crews will begin revamping the area this week. "We’re trying to be very patient and work through the process and work with people so we avoid tows and citations as our last resort," Berkeley police Lt. Kevin Schofield said. Marina tenants, too, are concerned about public safety and health. One man who keeps his boat at the marina says tenants have been dealing with syringes, human waste and criminal behavior. He says one camper even threatened his life. "This person had me inside the restrooms, threatening to kill me with a rock if I get out of the restroom because when I went in, I shut the door behind me, and he wanted in the restroom," the tenant, named Bruce, said. Campers, meanwhile, say they have been good neighbors. They say they have nowhere to go. "Where are we going to move it?" Gonzales said. "And then when they come and tell us to move from there, where are we going to move to then?" A spokesman for city says now that the campers have moved to another part of the marina they’ll have to assess what to do next.